Opening hours: every day (during the Songkran holiday. And New Year). Chiang Mai National Museum, the Museum of Fine Arts Department was established at regional level. The conservation and education center providing information on cultural issues in north province. And the upper north. Also known as a traditional Lanna is the place to visit when traveling to Chiang Mai. To learn about the history of this city. The history of art or way of life in housing since the city is flat. His Majesty the King. And Her Majesty Queen Sirikit. He presided over the opening. Chiang Mai National Museum, which is building the Thai Chaturaphak two gable decorated with folk art in the permanent exhibition and visited the building on February 6, 2516 AD. The Fine Art of Lanna. The National Museum is a truly regional. And benefits. Widely to the public for students and tourists who visit. By car: from CMU. Use Touy Keaw Rd. until see intersection Rin Kam and then turn left to Super Highway Road (Chiang Mai - Lampang) over the Wat JedYod around 500 Meters and then it’s located on lift side. 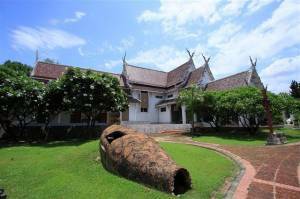 The museum displays various information about the city as the capital of Chiang Mai. The history of the Lanna Kingdom. Geological conditions. And the ancient landscape and environment of the North. Prehistoric human settlements. Lua and the original tribes of the north people. It also shows the recovery of independence from Burma. And relations with the Kingdom of Siam. Economic trade. During the first phase 2399 - 2463 and during the 2467 - 2482, when the train arrives. The story of life. And social development such as agriculture, industry and foreign relations. Phenomenon of Lanna art. And art in Thailand. The exhibition is divided into 6 sections. Exhibit 1 shows the background of Lanna Kingdom over the earth is full of life, geology and fossils. Northern landscapes and the environment. Prehistoric human settlements. Including the story of a tribe Lua and Haripoonchai people it’s the first province in North of Thailand. Exhibit 2 shows the history of the Lanna Kingdom. From the founding of Chiang Mai. The rise and fall of the kingdom. Exhibit 3 shows the story of Chiang Mai. Under control of Siam from the salvage of independence from Burma. The year 2339 when the city and its relationship with Siam. Exhibit 4 shows the trade and economic stage. Between AD 2339 - 2463 and the second phase. Between AD 2467 - 2482 when the construction of the Northern Railway. Exhibit 5 shows the story of life and social development. Such as agriculture. And industry. Finance. Relations with foreign countries. Including education and health. Exhibit 6 shows the evolution of Lanna style.